Out today to a mixed area, where we mainly explored the heathland part. Saw Green Tiger Beetles in the first few minutes, but, like all the invertebrates, they were extremely active in the hot sun, and I didn't get any pictures. There were lots of solitary bee/wasp nests, and we saw Ruby Tailed Wasps. 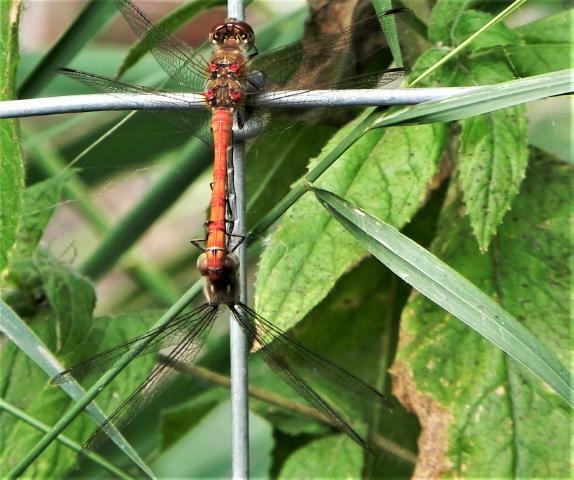 A variety of dragon and damsel flies round the ponds, but again, far too active for pictures. One person, several times, said "Oh, look! Purple Hairstreak! ', pointing at a fast vanishing black dot high in an Oak tree. I haven't photographed Stock Dove before, even though they live in the garden. They seem to be secretive, as I hardly ever see them, though I hear them frequently. The insects are very fast moving at the moment aren't they. There are several butterflies I would like to look at but they won't stay still! Nice picture. What I saw hunting in my garden this morning. That's a fuchsia leaf, which gives you an idea of how small the spider is. When I first noticed it the caterpillar was thrashing around. By the time I got the camera and went back outside it was limp as the spider scuttled to the underside of the leaf. the spider will have a decent meal out of that, nice snap. Have missed a couple of Mondays for a variety of reasons, and last time I went out did not get any usable pictures. However, last Monday was pleasantly cooler and we had a very good walk, finding an excellent cluster of Violet Helleborine, making a much better showing than they did last year. Plenty of butterflies (Ringlets, Gatekeepers, G V Whites, several rather worn S W Fritillaries and one extremely worn White Letter Hairstreak). PS Meal at the "All you can gobble" Indian buffet after the walk. Very enjoyable. Did you get a picture of the violet helleborines Buzzy? 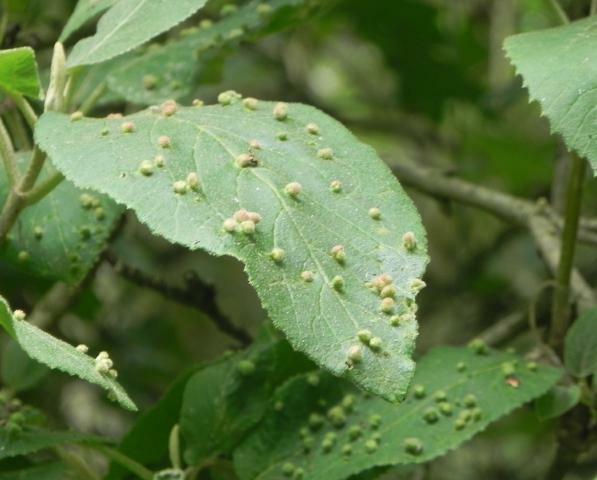 We have wayfaring tree in the woods, but never noticed any galls on them. Perhaps I should go looking. 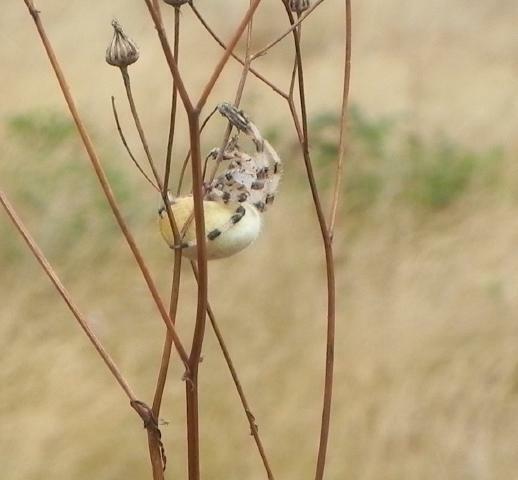 Last week we had a very warm walk on some very dry grassland - but we did see our target species (Dodder - lots of it) and the gall on Dyer's Greenweed (just two of them). This week (yesterday) was much cooler, but the grassland was still very dry. We did find a few small specimens of Slender St John's Wort but they had finished flowering and were most unphotogenic! Good pictures. 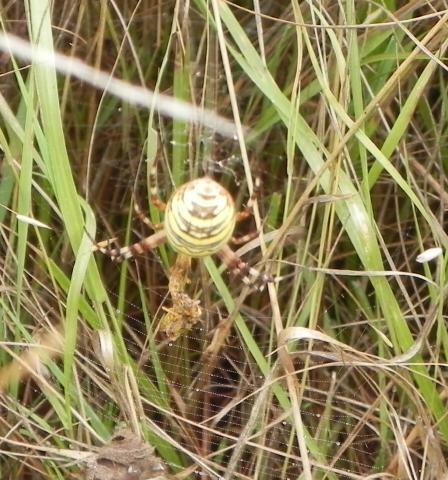 Afraid I can't identify spiders. Today we had a walk round an area of flooded gravel pits, expecting to see lots of water birds. Well, there were lots of birds, but mainly the 'usual suspects'. Swans, Coots, Mallard, Lapwings, Great Crested Grebes, various gulls and terns, a few Little Egrets (lurking amongst the Swans and pretending to be skinny Swans). Two of us saw a Bittern, flying between two patches of reed (not me, sadly). which one of our mycologists hailed as a new county record until it was pointed out that we had just crossed the border into the next county! It turns out that there are four previous reports in 'our' county, which Mr Myco had forgotten (or didn't know)about. Also there are two reports from the next county. It's clearly not a very commonly reported species. It's called the Tiger Sawgill (Lentinus tigrinus). The gills are toothed (a bit), but it's not especially tiger striped. 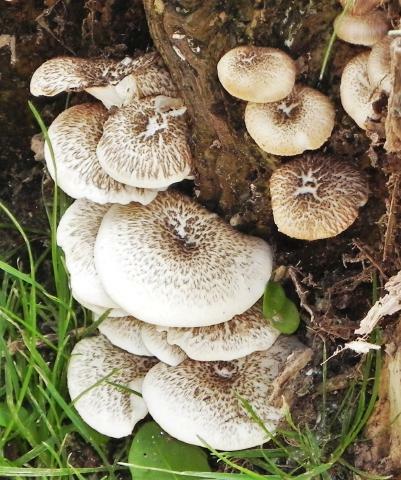 Oddly enough, though it quite clearly has gills, it is placed in the polypore family. Not sure how the mycologists justify this. 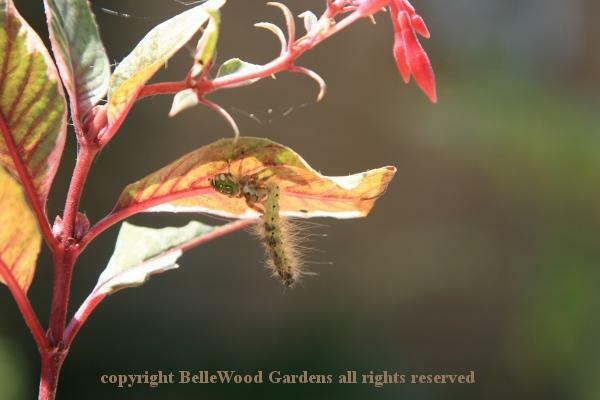 We have seen a few dragon flies about in the woods which is without water, so they must fly quite a way. Nice picture of them. Have so far found one unidentified bolete, and what I think is a Dryads saddle on a dead tree, although it may be some other fungus. Afternoon visit to an arboretum on my way home. 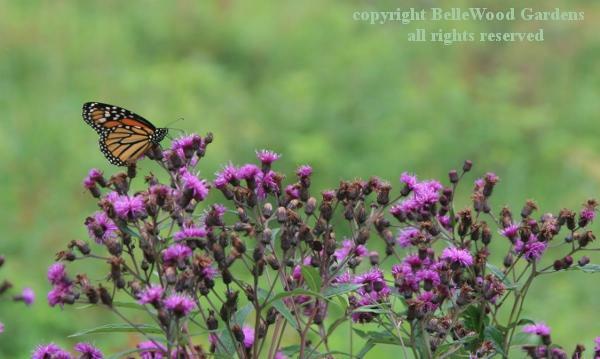 Monarch butterflies nectaring on ironweed in the big meadow. Preparing for their migration towards Mexico, perhaps . . . If we get Monarch butterflies at all, it is a very rare sighting. Nice picture Jam Lady. Saw a yellow one and lots of speckles woods yesterday in the New Forest; think the yellow was probably a brimstone, but it was too far away to be sure. 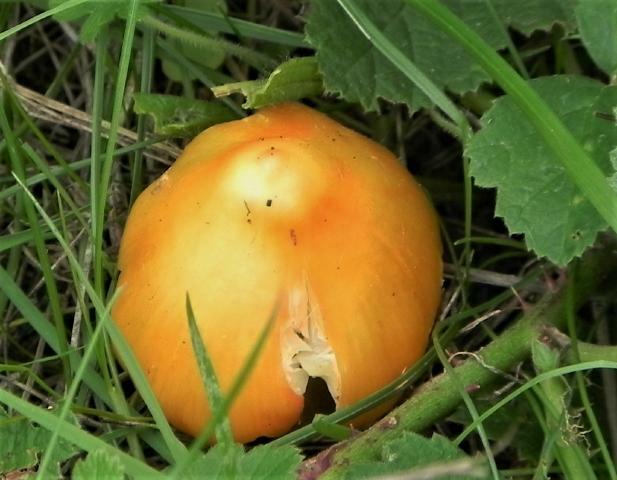 which is one of the Waxcaps, but I'm waiting for Mr Myco to tell us which one. There weren't many birds, though we saw a couple of possible Marsh Harriers (one on the way there and one on the way back). We went to our nearby favourite café/restaurant afterwards, which is always a good way to end a walk!